STAR Tasmanian filly Mystic Journey wrote her name into the record books as the inaugural winner of the $5 million All-Star Mile (1600m) at Flemington today and in doing so delivered a gift to Tasmania for which no price could be set. The Adam Trinder-trained three-year-old treated her rivals with contempt as she sat three-wide with little cover for the last 800 metres of the race but when jockey Anthony Darmanin called on the daughter of Needs Further to deliver she did what she does best. As soon as Mystic Journey caught sight of the leader Hawkshot she set sail for the line and along the way hauled in proven weight-for-age performer Hartnell and hit the line well clear of that horse with quality mare Alizee third. Trinder was surprisingly calm after the race. “Well, that’s it then, she’s done it,” Trinder said. “We set her for the Australian Guineas as her main mission and that would have been enough but today she proved even more. Darmanin was spent after the race, emotionally and physically drained. “We did it and that was seriously the ride of my life,” Darmanin said. 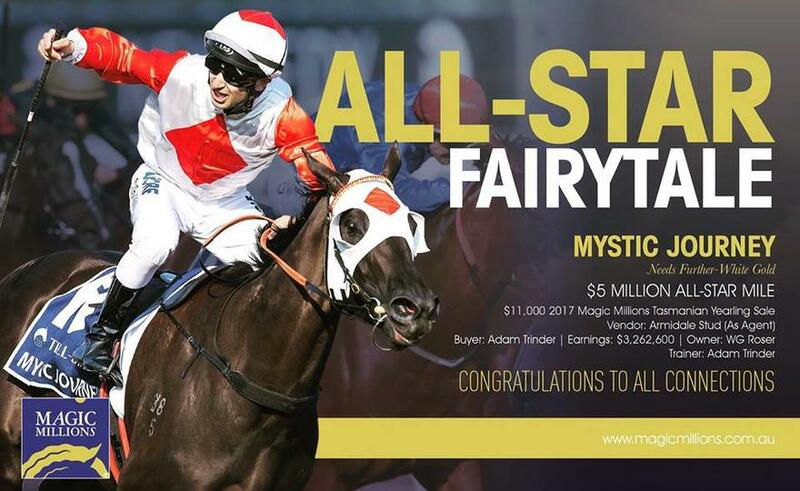 Mystic Journey was bred at Armidale Stud in Tasmania and being by its resident sire Needs Further, the stud’s managing director David Whishaw could hardly speak as the tears flowed freely down his cheeks. “This win and this filly has done so much for Tasmanian racing,” Whishaw said. Mystic Journey’s owner Wayne Roser was composed before and after the race but he, like most who urged the filly home, knew that the victory was more than just about winning. Punters around Australia, in the end, had faith in the filly, backing her in to start the $3.40 favourite while all others drifted in the market. Corporate bookmakers reacted swiftly to Mystic Journey’s dominant All-Star Mile win by slashing her price to win the Cox Plate from $15 to $6 and second-favourite behind the Autumn Sun at $5.